Let’s go back to you and all of the lovely things you want to make for your Valentine! I am loving all of your requests! When the request for chocolate marshmallows rolled in, I made them straight away. The thing about making marshmallows is that after you make them once, you have all the ingredients in your house to make them again. And then after you run out of the ingredients, you find yourself buying more boxes of gelatin and light corn syrup because after eating homemade marshmallows, the ones at the store are just no longer acceptable. It’s a habit, yes, but it’s one I’m happy to have because it only takes 15 minutes. Seriously. They take a few hours to set up, but start to finish work is only 15 minutes. It’s a sticky 15 minutes, but it’s a good time. I used dark cocoa powder in this recipe to make them as dark and chocolatey as possible, but regular cocoa powder will be just fine. Another optional step is the dunking in chocolate bit, but during my rigorous taste-testing routine of taking a bite of a plain chocolate marshmallow followed by a bite of chocolate-dipped chocolate marshmallow, it was no contest. But just to be sure, I repeated the routine several times. It’s safe to say everything is better dipped in chocolate, and it’s also safe to say that I couldn’t be happier to be your official marshmallow taster. I based this recipe on my small batch of homemade marshmallows, so if you’re looking for a plain vanilla version, I gotcha covered there, too. The recipe is poured in a loaf pan to make 8 large marshmallows, or 12 mini marshmallows. I read on Pinterest that you can dissolve chocolate marshmallows in hot milk for instant hot cocoa. I haven’t tried that, since all of the marshmallows were used in my rigorous taste-testing process, but with the next batch, I will! But can you just imagine two of these babies floating in your hot coffee? I have to go now. I can feel another round of taste-testing coming on. First, line a 9 x 5-inch loaf pan with parchment paper or foil. Spray with cooking spray. In a medium sauce pan, add the granulated sugar, corn syrup, salt, and 2 tablespoons of the water. Clip on a candy thermometer, and turn the heat to medium-high. Bring the mixture to a boil without stirring, and continue to cook until it reaches 238-degrees Fahrenheit. Meanwhile, add another 2 tablespoons of the water to a medium bowl, and sprinkle the gelatin on top. Let sit to dissolve for 5 minutes. Next, in a small dish, add the last 2 tablespoons of water and microwave for 25 seconds, until hot. Remove from the microwave carefully, and then whisk in the cocoa powder. Stir the cocoa powder and water mixture into the gelatin. Once the hot sugar is at the proper temperature, begin to slowly stream it into the gelatin mixture while continuously beating with a hand mixer on medium-high. Be careful not to pour the hot molten sugar near the sides of the bowl because it will stick and harden immediately. Beat the mixture for 10 minutes, until light and fluffy. Beat in the vanilla last. Pour the mixture into the loaf pan, and let set for at least 3 hours. To serve, lift the parchment paper or foil out of the pan, and cut the marshmallows into squares with a well-greased knife. Grease the knife between each cut. If the marshmallows are too sticky, roll them in extra cocoa powder. If dunking in chocolate: place the marshmallows in the freezer for 5 minutes. Combine the chocolate chips and coconut oil in a small microwave-safe bowl. Microwave on medium heat in 30 second pulses until melted, stirring between each pulse. Stir until chocolate is evenly melted and smooth. Remove the marshmallows from the freezer, and dunk half of each marshmallow in the melted chocolate. Place each marshmallow back on the sheet, and refrigerate until the chocolate sets, about 5 minutes. *You can use regular cocoa powder. This just might be the best recipe you’re ever posted! Bar None. Confession, I buy those uber expensive marshmallows from William Somona (they’re that good) but I should be making these for my Valentine. My 2-year-old daughter or my Luv Luv as I like to call her. She was born very near V-day and came very close to be named Valentine. (husband exercised veto power here!) Thanks for the inspiration. So true that “it’s a sticky 15 minutes,” but so, so worth it! I love making homemade marshmallows, but have never attempted chocolate before. These look beautiful! Thanks for putting yourself on the line to make sure these are juuuuuust right for us. Per usual, you are da best! I’ve been having such chocolate cravings recently, which is odd because usually I’m more of a poundcake or ginger cookie fan. But, no, chocolate has been on my mind. These look so wonderful and the perfect way to end a Valentine’s Day dinner at home. Chocolate on chocolate. Yes, please! Love these. Homemade marshmallows are the best! What an absolutely perfect marshmallow! 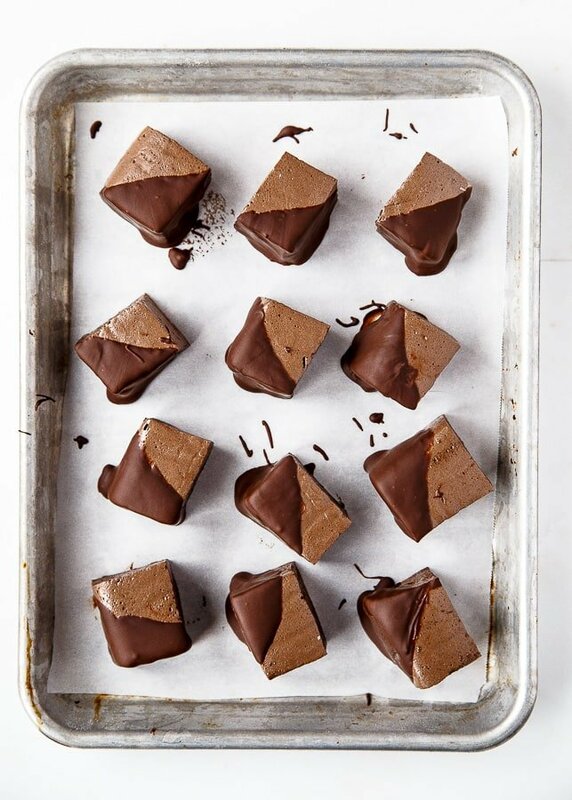 And I love that you dipped them in more chocolate…best ever!!! Can you believe that I have never made homemade marshmallows? It’s one of the things on my baking “bucket list”…gotta fix that soon!!! Love the idea of having a couple of these floating in my morning coffee! I think I NEED these. Wow. Fabulous! What?! I didn’t even know chocolate marshmallows were a thing!! I love making marshmallows and now I can make chocolate ones. There goes my waist line ….but who cares…..it is chocolate marshmallows! GIRL these look absolutely spectacularly amazing!!!! I wish I was brave enough to make my own marshmallows but now you are starting to give me the confidence!!! Love love love! These look great. Should there be something in step 13? Hi Peggie, sorry it was a duplicate of step 12. Sorry! I’m the absolute worst about instruction typos because I paste them over from a Pages file. Sorry! Woah, chocolate marshmallows! Nice work, they look awesome! Yes please!! I would rather have these than a box of chocolates any day! Holy delicious!! Definitely the perfect way to make hot chocolate more deadly! these look awesome! 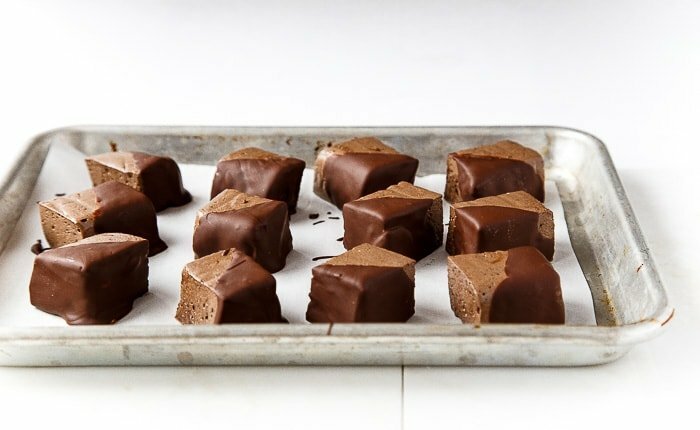 I’ve never made marshmallows before, but I totally want to try this chocolate version! yum!! I love your rigorous taste-testing process. These look great – beautiful photos. Pinned for future reference! When I saw this in my inbox, I thought, Oh! Yum! Chocolate-dipped white marshmallows. Logically, I should’ve stopped myself right there. 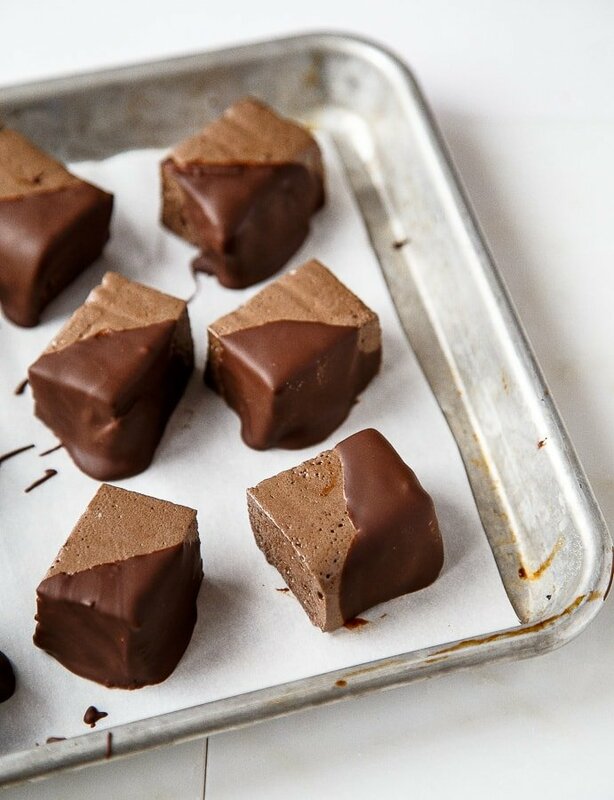 Leave it to you to create small-batch DOUBLE CHOCOLATE marshmallows. That’s just a whole ‘nother level of epic. Pretty darn impressed over here, and man, there are few glories like homemade marshmallows. I think I’ll try the hot cocoa thing alongside a mug of these floated in a bit of coffee. Just for, you know, recipe testing purposes. I, for one, appreciate your taste testing sacrifice. Now, I’ll know for sure to slather these beauties in plenty of melty chocolate. They look divine! Once you’ve had a homemade marshmallow, the bagged version is just never the same! And then you go and add chocolate to them and then DIP them in chocolate and then I’m ruined!! ;) These look amazing Christina! 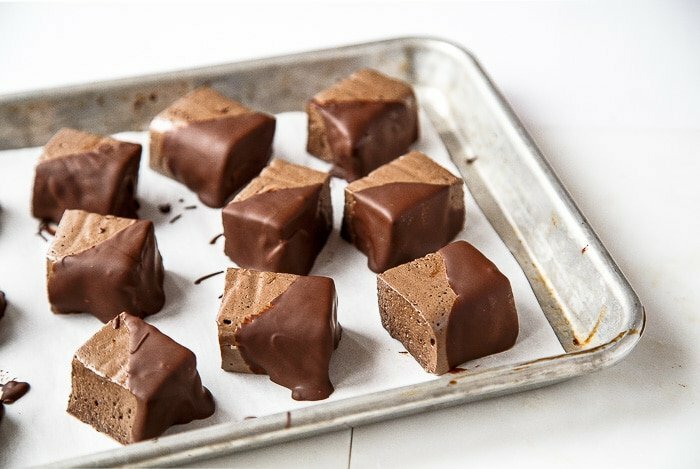 I don’t think I’ve ever had chocolate marshmallows before – these would be so good in cocoa! Goodness—-these are wonderful. I can tell right off they are very very very addictive. I have never seen a chocolate marshmallow to start with. So there you have it—I say with wonder in my voice. Its been over a year since I’ve made marshmallows and I really don’t know why. They are so fun (but yes, messy and sticky), plus these chocolate on chocolate marshmallows are calling my name!! These look absolutely magical! Wowza…I have to make these stat! These look like little pillows of pure bliss! As a chocoholic, I would help you taste test in a heartbeat. Ya know, just to be quadruply sure about quality control and all that. ;) But until then, I’m fantasizing about your chocolate marshmallows + hot coffee idea! Pinned! 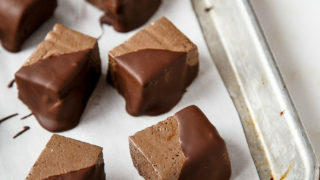 I have to make these chocolate dipped marshmallows! They look awesome! I never have made marshmallows from scratch before so thanks for the inspiration and recipe Christina. Loved these! I was so scared to make them, but they were so easy with your directions. These are wonderfully delicious. You’ve never had marshmallow till you’ve tried these. Unfortunately, I think I burned out the motor on my KitchenAide hand mixer. What’s the reason for not using a stand mixer? Oh man, those look fantastic! I am totally guilty of sitting on the couch and devouring a bag of marshmallows, so I’m afraid of what I’ll do with these. Pinned! These look delicious! I would love to make these in some silicone molds so that I could make them in bulk for gifts. Do you think these would set up in the molds? Also do you think these could be frozen so that I can make them ahead of time? I can’t wait to try them! I don’t think you can freeze gelatin. But silicone molds are a great idea, as long as they’re sturdy. If they’re floppy, then the marshmallow mixture will push the sides of the silicone molds outwards and they’ll set in weird shapes. Do you not have a bread loaf pan? You can double the recipe and make it in a 8×8 brownie pan?